More road art variations have been throwing themselves into the mix lately. Ever since a seemingly random and inconsequential encounter with blue and white stripes painted on the exposed inner trunk of a fallen pine tree, any oddly shaped configuration of objects by the side of the road has become a potential artwork. On my way to Ballarat not long ago, as I was driving into town, I noticed a giant tree sculpture. 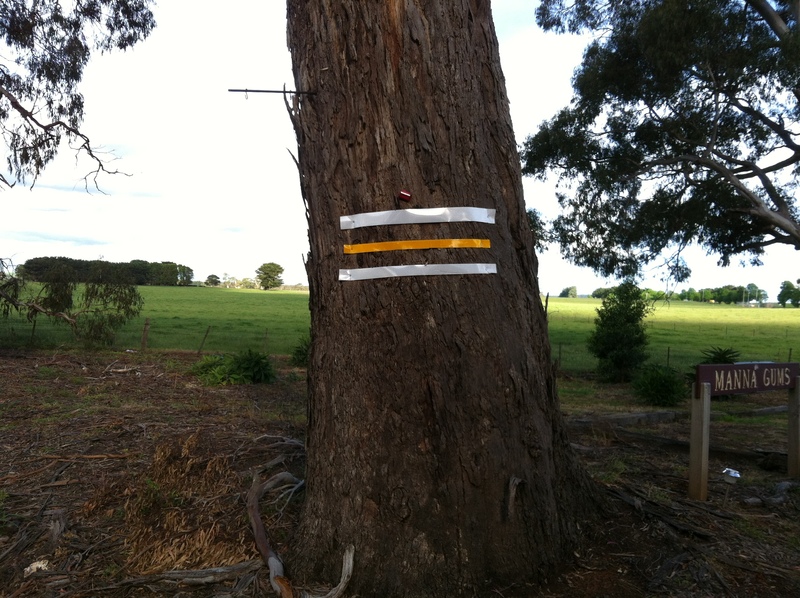 On my way out of Daylesford one day, the abstract geometry of reflective safety stripping caught my attention. On my way back from Bendigo last month a giant rusty architectural framework sat confidently in a large field. And a few days ago, navigating the dog-leg turn taking me passed the Glenlyon General Store, a hand-woven plastic tower stretched itself from the green lawn to the lower branches of an old oak tree. 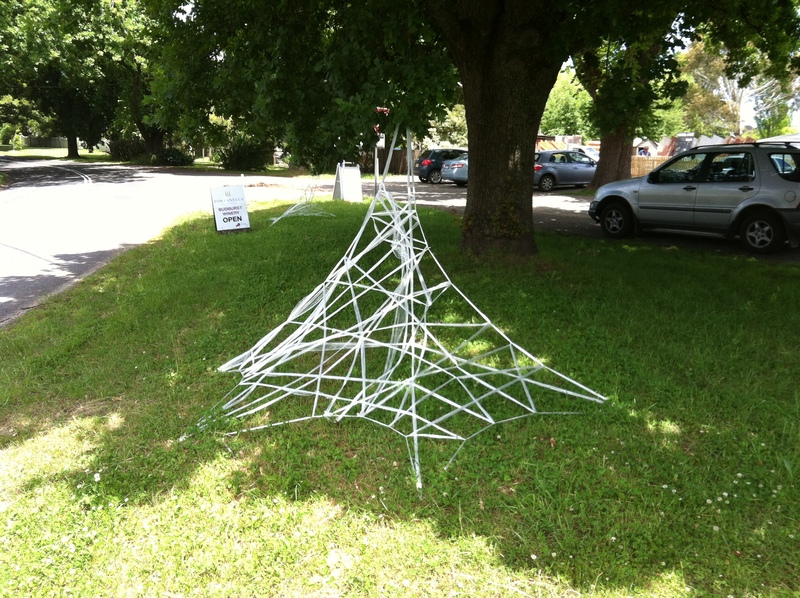 The Ballarat street tree sculpture was a wonderful sight (see also: site). This very contemporary form of topiary (the art of shaping trees and plants; see also: giant bonsai) can be seen all over the urban and suburban landscape where electrical wiring, telecommunication cabling and poor urban planning has collided. This collision has resulted in a work-around, bandaid-style solution that, by sheer accidentally chance, has conjured up a new form of contemporary sculpture. Where most art is created in the service of the expression of the artist, this art is created as a result of a set of processes or actions unrelated to any artistic intention. And yet, the sheer act of identifying it as a form of sculpture, might actually make it art. So how do you ‘make’ something art? How can you just point at it, say it’s art, and voila, it magically becomes art? Well, that’s where the toilet comes in. Here’s a quick divergence into some art history, as a way of background. A genius French artist, named Marcel Duchamp, once exhibited a men’s urinal at an art gallery. In fact, it wasn’t actually accepted by the gallery, and wasn’t exhibited. And this helped establish its reputation even more. This singular event is often cited as the seminal moment in recent art history. Possibly the most important impact on art since single-point perspective was refined in the 15th century. And in a ridiculously generalised nutshell, here’s why – Duchamp plonked a piece of hardware that he bought at a store, an item mass-produced and available to purchase by pretty much anyone, from any number of shops. He didn’t make it, but he signed it like it was an artwork (with a fake name, for comic value and to throw the artist’s power further away from any obvious connection), and located it in a gallery context. And that was why it was art. Why – because he was an artist, he selected the object, and he presented the object inside a territory of art. That’s what’s got me wondering about these road art sculptures I’ve been spotting lately. As soon as I point at them, and I publish them on a website devoted to art – kapow – they art! Unlike Duchamp, this does not make me a genius, however. Not even close. He gets that credit because he instigated this whole way of thinking about art. He invented something. From scratch. Out of thin air. That’s genius. But, Duchamp’s legacy is that we are all endowed with the power to point at things, designate them as interesting, and give them potency. And that’s a wonderful thing. Look around you now and see what objects are close by. See what combinations of things sitting together look somehow oddly interesting. It’s possible that beautiful, thoughtful and intriguing things are around you all the time and they took little ‘artistic’ effort to combine. You didn’t need to craft them, stick them together, colour them in, sew them or even paint them. They were miraculously brought together by a series of chance encounters and events. But at the right time, at the right place, under your attentive gaze, they became something of interest. As if endowed with an invisible form of gravity. Now, these sorts of artworks are easily fickle and ephemeral. After all, if you see a teaspoon balancing on the edge of a copper bowl, which itself sits on a folded newspaper, perfectly aligned with the head of the Prime Minister on a front-page photo, well that’s only going to be art to an audience of one – and that’s just you staring at it in your kitchen. The only enduring legacy these artworks will achieve is if they are capable of distributing themselves. This creates an accumulation of audience and grows the gravitational strength of the work. Duchamp’s toilet is in millions of copies of books, all over the digital archive of the internet, paid homage to in other artworks and brought up in almost every basic art school introductory course. In this way, its power is reinforced and continues to grow, and it lives on beyond the physical reality of its material. Such is the power of the idea in art. The idea is a material. Tags: article. Bookmark the permalink.